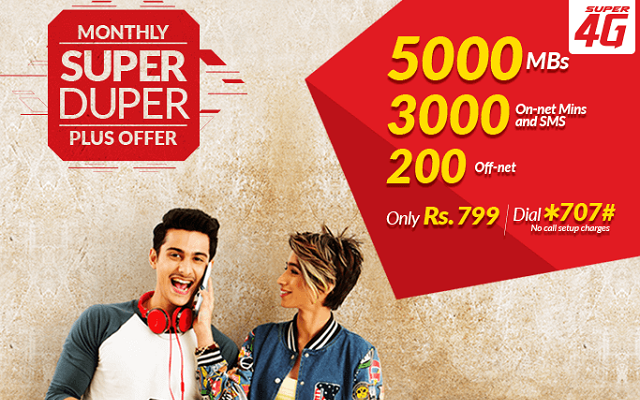 Mobilink Jazz introduces an all in one Monthly Super Duper Plus offer that covers all your needs. Enjoy whole month super 3G internet 5000Mbs, 3000 Jazz+Warid minutes. And 200 minutes for other networks. Furthermore, 3000 SMS to all Networks. Jazz users can subscribe Monthly Super Duper Plus Offer in just rupees RS.799 (Incl.Tax). With monthly super duper plus offer enjoy best 4G internet or 24/7 call experience. Moreover sent SMS to any network for the whole month without any hassle. Mobilink Monthly Super Duper Plus Offer Subscription Details 2018, Jazz Super Duper Plus offer, Mobilink Offer.